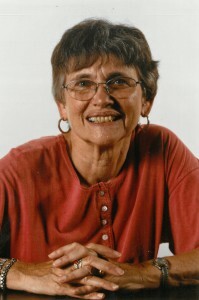 Author Johanna Hurwitz has been entertaining young readers since 1976. She shares some of her fondest memories and considers the changing trends in middle grade literature. Johanna Hurwitz, author of more than 60 books for young readers, began publishing in 1976. Before that, she received her MLS and worked for many years as a children's librarian. Her lighthearted and relatable stories center on school and family experiences and have become beloved favorites for generations of readers. Who were you as a middle grade reader? What were some of your favorite authors or books? (I read an interview where you said you enjoyed the "Little House" books by Laura Ingalls Wilder and the "Betsy-Tacy" books by Maud Hart Lovelace, as well as Anne of Green Gables and Heidi.) When I was a middle grade reader, I lived in a small apartment building in the Bronx, NY. The public library was four blocks from home, and I went there about four times a week. I loved to read, but the frequency of my visits was probably due to the rule that one could borrow only two books of fiction at a time. I never read nonfiction, but I learned so much about life and the world from fiction. I think the appeal of my childhood favorites was at least in part because Laura Ingalls, Betsy Ray, Anne Shirley, and Heidi had a larger world than I did. They went outside without adult supervision and had many experiences that were exotic to me living in the Bronx. By the way, when I was growing up, there was no such designation as "middle grade reader." One read picture books and then moved on to everything else in the children's room. I couldn't wait to be old enough to start exploring the adult section in the library, too. When I was finally old enough and permitted to do so, I brought my first "grown-up" book to show off to the children's librarian. She laughed and went to a shelf in the children's room and found a copy of the same book. I wish I could tell you the title, but I don't remember what it was. You have mentioned that you draw a lot of inspiration from your children and grandchildren, but how do you keep yourself in touch with the feelings of your middle grade self? Did you keep a journal when you were that age? I was given a diary with a little lock (which anyone could have easily broken) when I was about 10. However, I credit the years I worked with children as a librarian, in public libraries as well as in school libraries, with keeping me aware of the feelings, the behavior, and language of young readers. What were some of your favorite things about the time you spent as a librarian? I loved working with children. I loved sharing my favorite books with them. And they shared their favorites with me. "Did you like this book?" a child might ask. When I admitted that I hadn't read it, they were shocked. Didn't librarians read every single book in the library? "It's one of the three books I haven't read yet," I would tell them, and they believed me. When children found books that they had been waiting for, sometimes they would kiss it with delight. That's why I loved working with them. When did you ever see adults kiss a book that they wanted to read? I also enjoyed doing programs. I gave story hours, celebrated birthdays of favorite authors [with] parties, and created a "cooking without a stove" program where we did lots of cooking but always connected it to books in one way or another. Some of my programs ended up being described in the books by my New York Public Library colleague and good friend, Caroline Feller Bauer. You’ve been publishing books since 1976. What are some of the trends in literature that you’ve seen during this time? Do you adapt your own work to these trends at all? Nowadays there seems to be nothing that is considered inappropriate for middle grade readers. When I wrote Much Ado About Aldo (1978), I held my breath while the editors debated whether a child could really tell his parents that he didn't want to eat meat. There had never been a vegetarian in children's literature before. (Bambi doesn't count. He wasn't a human being!) In the end, they gambled and I got away with it. Nowadays that seems like a very tame decision. I've written about divorce and dementia, but there is only one death in my 74 books. I don't want to write about mean people, bullies, fighting, war, etc. What do you think the enduring qualities and essential concerns of middle grade readers are? The enduring quality is identification. Can middle grade readers identify with the character they are reading about? While involved in a book, readers should be able to empathize with what is going on. A girl should be able to read about a boy and vice versa. 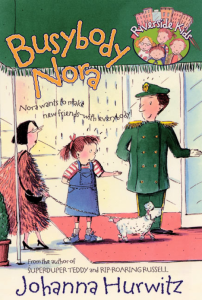 Even though Busybody Nora is more than 40 years old, it still circulates well in my library. Have you made any efforts to keep your work from being dated? For example, will the Kelly Twins ever text each other? It's funny that you ask about texting. Not too long ago, my book The Law of Gravity was made into an ebook and there are paper letters exchanged via the U.S. Mail between my main character and one of her friends. The ebook editor asked if those letters could be rewritten as text messages. At that point in time, I had not begun texting myself, and so I asked my 15-year-old granddaughter if she would like to take on the job. She did! Nowadays I do text, but I won't use that skill unless it seems very appropriate to the story I am telling. Some of your series were written over an extended period of time. What kind of relationship do you develop with your characters? Who are your favorites? In real life, I have two children and three grandchildren. When I write about children, they become very real for me. I might see something and think, “Wouldn't Ali Baba Bernstein or Karen Sossi like this?” Before I know it, I begin writing another book about this extended family of mine. Fortunately, I don't have to cook supper for all of them. Each of my series developed book by book. I never set out to write a series. How could I guess there would be 14 books about Nora, Teddy, Russell, and Elisa? I just wanted to write one book. Who are my favorites? You wouldn't ask that question of a mother, would you? I will confess, however, to having a special fondness for PeeWee the guinea pig. You’ve known some amazing authors. Who were colleagues that impressed and inspired you? About 25 years ago, David Adler and I met at a conference. We began talking and realized that we had many questions for each other. Since we both live on Long Island, I suggested to him that we invite other children's book authors who lived in our area to come for an evening at my house. That was the beginning of our writer's group, which has continued to meet several times a year ever since. Among the charter members who joined David and me were Seymour Simon, Pam Conrad, Ellen Conford, Susan Beth Pfeffer (who lived further away but was a first cousin of Ellen's), Patricia Reilly Giff, Sylvia Cassedy, and Trish Baehr. Over the years, Pat moved to Connecticut, and sadly Sylvia, Pam, and Ellen passed away. But in time, we were joined by others, such as Bernard Waber, Laurence Pringle, Eve B. Feldman, Jane Breskin Zalben, Laura Vaccaro Seeger, Gordon Korman, Douglas Florian, Marilyn Levinson, and Mark Shulman. 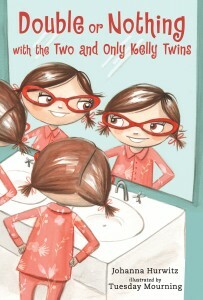 Bernie Waber passed away a few years ago, but his daughter Paulis, who is writing and illustrating now, has joined us. This are a lot of people, and it's rare that everyone can make every meeting. But whoever is there is a great moral support and gives advice to the others. We don't read aloud and critique one another's work, but we have learned a lot from one another nonetheless. Back in 2005, you graciously answered a letter I sent you and told me the best story about a connection you had with Carolyn Haywood. Could you share that with School Library Journal readers? While I was working as a school librarian in 1978, I was busy discarding some old, worn-out books. Among them, I found a rebound old book by Caroline Haywood. Not only was it worn but the pages were stained and even sticky. There was no question that the book belonged in the discard pile. Still, I knew that all those marks of age showed how the book had been loved over the years. I phoned my editor at Morrow Junior Books, who, it just so happened, was also Caroline Haywood's editor. I described the book and suggested that it be photographed and used in an advertisement. I was thinking of those old Maytag ads that showed washing machines that had done thousands of loads of laundry. Editor Connie Epstein laughed at my suggestion. "We don't do ads of that sort," she said. So I asked her if she would be willing to give me Haywood's home address. I wanted to show her what a truly loved book looked like. I got the address, and because it was close to Valentine's Day, I bought some gift wrap and made up a package to send. Then I worried that perhaps Miss Haywood would be disappointed because the package didn't contain chocolates for the holiday. I wrote a letter telling her that I wanted to show what a truly loved book looked like. A few weeks later, I received a thank you note from Caroline Haywood. And editor Epstein also thanked me. So many children, including me and my own daughter, had grown up reading and loving the Haywood books, but she never received any national honors. At least she got my Valentine. What a great article about a beloved author. I always promoted the Johanna Hurwitz books in our school library to the students because I enjoyed the stories so much. Aldo Applesauce was one of our favorites. Glad to see you are still writing and publishing. I will look for your books that I've somehow missed reading. Johanna is one of the kindest and nicest people I've ever met. Her writing retains and shows that her kindness is contagious. I love everything about her except that she didn't read nonfiction books when she was a kid. But hey, no one is perfect. Wonderful article and a wonderful lady!